WebSphere Application Server 4.0 delivers the Java 2 Enterprise Edition (J2EE) implementation. It is the IBM strategic Web application server and a key IBM eServer iSeries product for enabling e-business applications. The iSeries server and WebSphere Application Server are a perfect match for hosting e-business applications. You can build J2EE applications using WebSphere Studio Application Developer -- a new IBM application development environment. This is the follow-on product for VisualAge for Java and WebSphere Studio. It combines the best of these products into one integrated development environment. 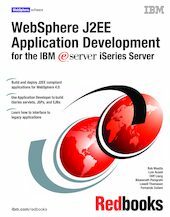 This IBM Redbooks publication shows you how to build and deploy iSeries J2EE applications and how to use them to access iSeries resources. It also shows you how to use your iSeries server as a Java server. It is written for anyone who wants to use Java servlets, JavaServer Pages, and Enterprise JavaBeans on the iSeries server. This book provides many practical programming examples with detailed explanations of how they work. The examples were developed using VisualAge for Java Enterprise Edition 4.0 and WebSphere Studio Application Developer 4.02. They were tested using WebSphere Application Server 4.0.2 Advanced Edition and Advanced Edition Single Server. To effectively use this book, you should be familiar with the Java programming language and object-oriented application development.